Collaboration is the essential ingredient for intelligent “workplace” teams, as studies have told us for decades — yet for many enterprise organizations even today, working together easily still remains elusive. Focusing on improving one small productivity task increases the likelihood of it getting solved. Choosing the most frustrating or inhibiting user problems to solve generates rampant user engagement — the number one criteria for enterprise software success in a cloud future. My favorite example is that you don’t have to reconfigure SAP and change your invoice processing workflow, just to solve getting SOWs signed. We simply incorporated electronic signatures into our file sharing app. If an executive is on the road, no need to print, sign, fax and return a document. Just fingertip sign and click to share, all in one place. Enterprises have enough company-wide initiatives to drive, and coming at collaboration as an entire reconfiguration can lose steam before it ever delights a single user. Adapt your collaboration services to users first, so approved apps are immediately desirable at the grass roots level. And rethink functionality from the user level to uncover potentially simple, shorter-term solutions. Why bother with 6AM conference calls and 14-hour flights? Because we are at the early beginnings of an era where imaginative thinkers are changing everything in sight – from thermostats to software. I’m talking specifically about design shifts in mobile enterprise software, the likes of which one day we will look back upon with awe. 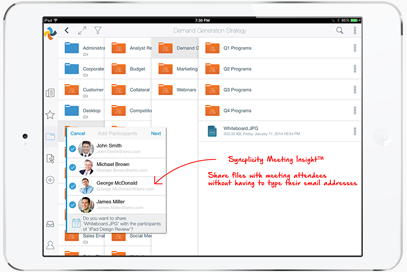 These past few weeks, I saw it in spades, as we launched Syncplicity’s mobile apps. In the first wave of mobile software development, incremental innovation simply brought old functionality to a new device. In the process, fundamentals were often missed. How frustrating to see a document for review on your mobile screen, yet be unable to edit it? Design was simply your desktop basic functionality, brought awkwardly to your smart phone. The second wave brought mobile on par with the desktop. Functionality was refactored amidst the new memory and added capabilities of our favorite gadgets. Less and less R&D teams argued if a mobile version of their software was next. But such design was still a parallel effort, a passenger alongside the driver of monolithic application development. SharePoint is now in the cloud? Interesting, but it doesn’t solve my problems. The reality is that mobile itself is the new design baseline, cleanly isolated and independent of any lingering PC notions. Mobile is the superset form factor, under which all functionality must be derived and considered. This third wave of design is what ignites our imagination and makes us want to drive 24/7 to brilliant new productivity solutions. Once we unleash imagination, it’s only a matter of time before the way we think about “productivity” will change in thrilling ways. Remember what “taking pictures” used to mean? It was a time-consuming and disparate routine of carrying camera equipment with you, buying film, configuring the camera settings, and at last, waiting to process the film. By rethinking “taking pictures” as “sharing moments,” however, those inefficiencies not only disappeared, but new worlds opened up. Ubiquitous devices brought image capture to the masses. Apps made photos easy and addictive to share. And social created a place where all the people to share photos with are constantly present. The same thing will occur as we rethink “productivity” from the mobile perspective. Many attributes of mobile are barely tapped today: proximity, location and personalization, for example. It’s time to think: how else can we eliminate knowledge workers’ wasted time, speed their transactions, and heighten their ability to share their value? Yes, mobile itself offers rich new design inspiration. But imaginative designers will rethink it all – the meaning of “productivity” included. Nest came up with an elegant and simple solution that worked and has continued to release new versions of the thermostat and its software, improving its simplicity and user friendliness. Nest has also continued to develop products beyond its initial market beachhead, including a smart smoke/carbon monoxide detector, which is a logical extension that naturally appeals to those who own or are interested in the Nest Thermostat. Take Splunk, for example. IT groups need analytics on all the critical systems they manage to better understand how they are performing. Rather than require IT admins to provide logs in a standard format, Splunk designed its system to import files in any format directly from the systems IT manages, and developed a dashboard of insights and alerts. It fundamentally changed IT operations without completely starting from scratch. Conventional wisdom holds that the consumerization of IT is going to take over virtually every market and that the entrenched enterprise vendors are in big trouble. This is no more apparent than in file sync and share where it is suggested that the new kids on the block are going to own the market at the expense of the establishment and that the needs of end users will trump those of enterprise IT. However, as someone who is in the trenches of this market every day, it is obvious that this is an overly simplistic view and ignores a number of truisms of enterprise user and IT requirements that aren’t going away. 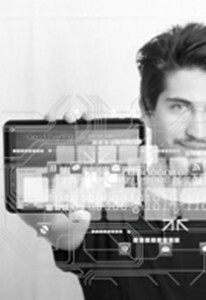 Our view is that strategic and trusted enterprise technology vendors not only have a role in the future of end user computing, but that their customers are asking that we help drive this transformation for them. This takes innovation and risk-taking, but before I expand on that, a little background. Some vendors in this market are trying to be all things to all people, pursuing a one-size-fits-all approach. This assumes that users will simply adopt what they want and IT will be helpless to reverse the trend. In reality, enterprise IT is alive, well, and very much aware of what is occurring in the file sync and share market. And they are increasingly controlling the selection and usage of the services, which cannot be defined in singular or generic terms. Consumers, SMBs and enterprises have different requirements and success requires focus— it is practically impossible to serve the needs of all of these markets in the long term. In fact, end users have greatly different requirements – the needs of an individual that wants to share photos is very different from one who is sharing business-critical files. The enterprise might be the trickiest market to solve because you are essentially going after two audiences – end users and IT – whose needs seem to always be in diametric opposition to each other. To succeed, you need to achieve a critical balance. 1. To be considered for enterprise deployments, you MUST have the blessing of IT. As the gatekeepers of technology deployments, they are never going to evaluate and bless solutions that touch a company’s most important asset – its information – without thorough compliance and security testing. 2. Getting 25 users in a small department in a Fortune 100 company to use your solution does not make you an enterprise solution or even make it easier to become the standard in a large company. The iPhone didn’t become an accepted enterprise device until it satisfied IT’s security concerns with email. 3. That said, enterprise IT knows that it needs to adapt and evolve. Users must love the enterprise file sync and share solution and have it become part of their work routine. If your IT department blesses the solution and no one uses it, then you have wasted your time and resources. While enterprise file sync and share has emerged as a critical service, for it to be embraced in the enterprise, it must disrupt old, inefficient ways of doing business, but not break either your IT infrastructure or your employees’ work habits. 1. Frictionless user experiences trump feature bloat. You cannot change the way people normally send, access, edit and save files – from any device on which they are working. File sync and share has to be an easy extension of what they are already doing on their laptop, tablet or smartphone, not a completely new paradigm. 2. Enterprises have spent billions of dollars on SharePoint, file servers, and other technologies to store content. Enterprises won’t solve the “silo problem” by spending billions more creating a new silo and assuming their customers will move everything there. That approach is the reason why we have so many silos to begin with! Any new solution must be an easy overlay to your existing systems – IT departments will not rip out and replace their existing investments. 3. Enterprises have an enormous IT and legal risk in meeting regulatory and security compliance. You must be able to support the compliance, data residency and security policies of the enterprise—and that means giving IT the flexibility to work within the existing security and compliance infrastructure they’ve already established. Do not force a new one on them. If you do, strike the word enterprise out of your product name. With these rules in mind, how do existing enterprise vendors lead the way? Simply put, to avoid being disrupted they need to be willing to drive the disruption themselves. While clearly a consumer example, Apple did just that by releasing iTunes on the iPhone even though they had a significant franchise with the iPod. And it worked. For file sync and share market, disruption means providing your customers flexibility. It means supporting and integrating with a wide range of cloud-based and on premise storage solutions. 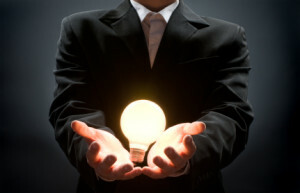 It means adopting business practices that are very different from the traditional enterprise technology approach, such as deploying key services in the cloud to maintain a high pace of innovation, pricing on a consumption model to better align with customer adoption, and making an inordinate investment in mobile apps and the end user experience. For those of us who have been and remain completely focused on the enterprise, this is a very exciting time. We are demonstrating that IT gets what they need and can serve the needs of the business user. The result: the incumbents have a legitimate chance to drive the disruption in the market. As you may have heard from EMC World, we’re working with Cisco to deliver an enterprise social collaboration platform. During my keynote yesterday, Murali Sitaram, Vice President and General Manager of the Collaboration Software Group at Cisco, joined me as we demonstrated the power of the Cisco Quad platform with EMC Documentum. Below is a short conversation Murali and I had to discuss our plans. Yesterday, May 10, I gave a keynote presentation at Momentum at EMC World in Vegas, and shortly after I began to reflect on the past several months which have been a whirlwind. As most of you know, I joined EMC’s Information Intelligence Group last July after having co-run Doculabs for close to 17 years. Not knowing how it would feel to move from a “think-tank outfit” to a major enterprise vendor, and my strong obsession for not wanting to make my blog a commercial for a company’s products, I decided to take some time to reflect and hold off on writing blogs. But now I’m back, in a big way. And what a great period for reflection it has been! !